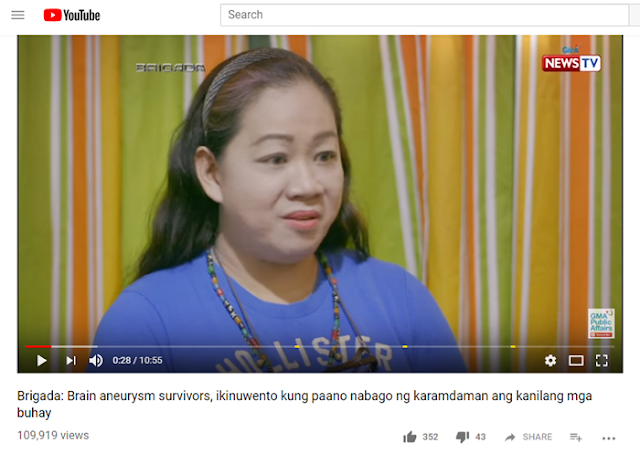 Hi, my name is Cha Sy and I am a survivor. A Ruptured Brain Aneurysm Survivor. People I met almost always says I look normal. The truth is my left eye still has a combination of black and white clouds. That hinder me from doing the tasks that I used to love. Yes, that clouds are the very reason why I still can't drive. Those who know me personally would vouch my love for photography and traveling. Unfortunately, I had a problem with my balance so I can't take good photos and videos anymore. But I recently bought a tripod so, I think my problem would now be partially solved. Here is our interview done by Ms. Lala Roque for Brigada. Thank you very much.